C.'s Mom sent these pictures to me a few weeks ago. C's Dad has been working on a home gym in their basement. He is taking special care to ensure that the gym is a place where the whole family can be together. C's Mom writes "I thought I'd send a few pics your way of our gym in the basement. Still not finished, but the girls are enjoying it just the same. " "Once again, really economical. We bought the rings, ladder, and attachments at IKEA, and they're great for indoor play. M. can't reach the rings on her own yet, but is happy to hang there for quite some time if she's lifted up." "We intend to add climbing rings to the wall with some rock climbing holds as they learn more climbing skills. " I've shared this on the blog because home gym's are not something I have ever considered through the "Montessori" lens. (My experience with gym's is lots of sweaty adults working out on strange looking contraptions. 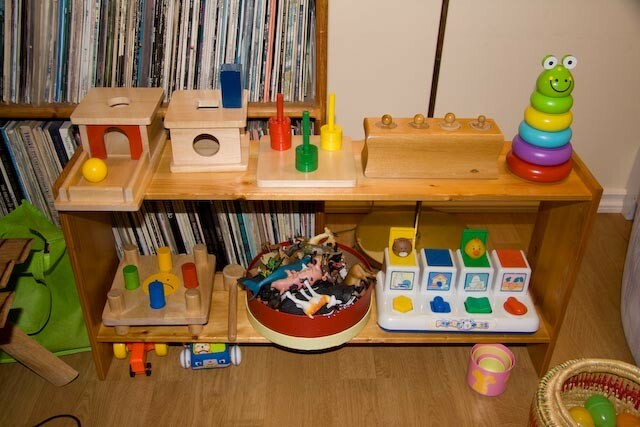 The only place for children was in the "playroom" - usually a big room full of toys and a caregiver. ) However, C's parents have shown me that with some careful thought and consideration for the developmental needs of their children, a home gym can be a place for the entire family. Stumbled upon your blog from the search engine(cleaning up spills-montessori). So I just wanted to stop by and say hello! I love the idea of a kid's gym in your basement. You just gave me a wonderful idea (great when were kooked up in the house in the winter). Where can I find those rings and ladder? I can't see it on Ikea's website. I'll ask the Mom but they might not be sold anymore. I have found that Ikea doesn't seem to offer the same products from year to year. Good luck.